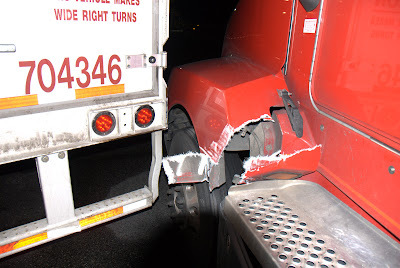 A driver in a US Express truck had managed to back into the driver’s side fender on my truck… the very same one that was replaced six months ago! The poor flasher light at the back is hanging on only by the electrical cable, and you can see the fairing between the steps on the side was bent outward as well. Oh, and my mirror has a slight scrape on it too. Steel meets fiberglass, steel wins. Tomorrow morning I need to be up super early to drive a few miles to the local Petro repair shop to get some temporary repairs made, then I will deliver my load and get sent to Joplin. 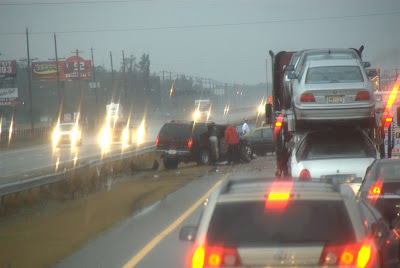 Where my truck will get fixed (the fender) and fixed (neutered back to 65 MPH). 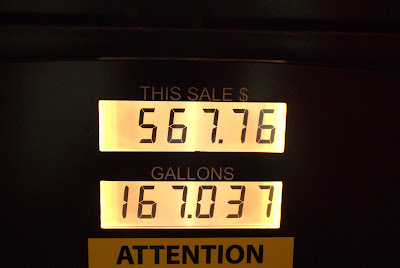 And you thought your fuel bill was big! After another three hours of driving I pulled off at Florence, South Carolina to fill up my other tank with a 20 oz. ribeye for $9.99 at the local Petro. Yummy. 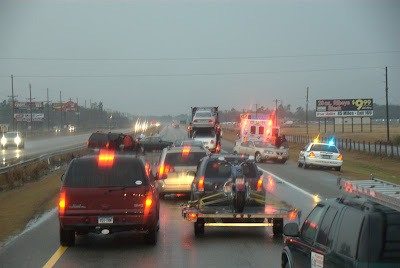 I came up on this one shortly after it happened, while the police and emergency vehicles were still on their way to the scene. Traffic for the next 120 miles or so was pretty much bumper-to-bumper, with lots of slowing. Upon entering Georgia it went to three lanes and the traffic sorted itself out. Anyway, I drove 555 miles today and stopped at a truck stop just before entering Florida, about 15 miles from my destination tomorrow morning. I expect I will be ordered down to Palatka, Florida after I deliver to pick up yet another load of paper products bound for the midwest. I rolled in to Chesapeake around 0400 local time. The receiving folks at the Sam’s Club in question had heard nothing from our crack Customer Service people, so they just assumed I was slacking. Got me unloaded very quickly though. The lot behind the warehouse was just big enough to shoehorn in one last semi, namely mine. I was blocking a row of bobtails in where I parked but I didn’t plan on staying long and they could always pound on my door if one of them had to move. None did, and I got a couple hours rest. Around sunrise I drove around the front side of the complex to the Super Wal-Mart next door to refill my pantry. Hard to believe it, but I spent over $85 — I haven’t been able to stock up in a while. Right when I got back out to the truck I got beeped with a new load picking up in Richmond, Virginia then delivering in Jacksonville, Florida first thing Monday morning. This would ordinarily be a craptastic 700 mile weekend waste of time, but in this case it will allow me to reset my hours and take a much-needed break. Plus, it won’t hurt to be heading south versus north at this time of year. UPDATE: It turns out I’m loaded with 16 tons of Ramen noodle containers. College students rejoice! I’ve seen these signs in Ohio for a while now, and I even saw one in Georgia last time I was through there. 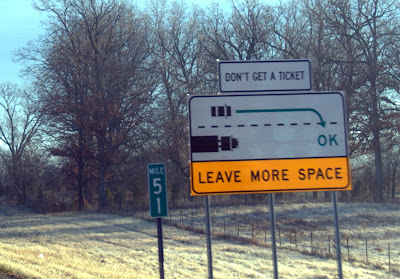 States: more signs and more enforcement of them please! Yes, it is that time in this busy holiday season to take another huge (read: heavy) load of water across our roads. I got deadheaded to some unpronounceable town in Pennsylvania (Breinigsville… say that three times quickly) where I’m currently waiting for a Nestle plant to load me up with 46,000 lbs of water, destined for Chesapeake, Virginia. They originally wanted me to get it there by 0100 tonight, but with my 10 hour break that would have required a governed speed of approximately 110 MPH. I petitioned for this small change, but was denied. Corporate believes it is better to just adjust the time out. They still can’t have my 70 MPH truck back! 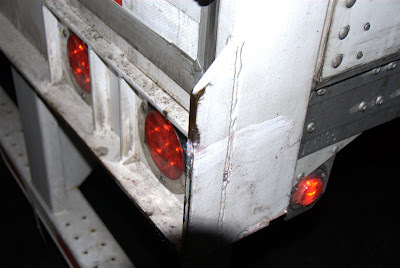 Details like having a tight, blind-side back around the front end of a parked truck whose nose is about two feet into the space I need to use to back. Details like very slow warehouse personnel taking their sweet time unloading my truck. They have a new load for me when this is done… going back the way I came into Pennsylvania then down through Delaware to the Chesapeake Bay area in Virginia. No, not that stuff, silly! 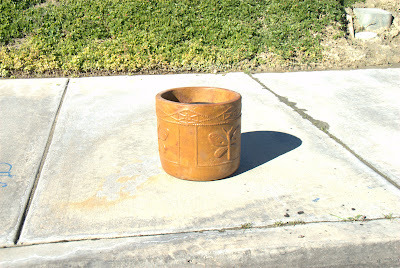 The load I dropped last week in Los Angeles was mostly super large clay pots for plants and trees, but they had a few smaller ones and I worked out a deal with the consignee to get one for my mom as her Christmas gift.